Daucus carota is commonly known as wild carrot or Queen Anne's lace. The most famous member of this species is the domesticated, or cultivated, carrot. 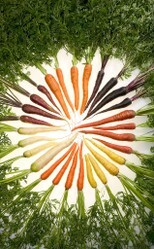 Carrot coloring has not always been characterized as orange. In fact, throughout most of its history, the wild carrot has presented an array of dark colors. The fascinating history of Daucus carota, including its seamless acceptance into European and then American cuisine, is glimpsed. Mysteries still remain about the journey of this appealing vegetable from wild living to worldwide renown. Daucus carota subspecies carota is commonly known as bird’s nest, bishop’s lace, Queen Anne’s lace, or wild carrot (Greek: καρότον, karōton, “carrot,” from Proto- Indo-European ker-, “horn, head”). Daucus carota is in the family Apiaceae. This family is synonymously known also by an older family name, Umbelliferae, which recognizes that the plants in this family generally display an inflorescence (Latin: inflorescere, “to come to flower”), that is, flowering, that has the shape of an umbel (Latin: umbra, “shade, shadow,” from Greek όμβρος, ómbros, “storm”), which is an umbrella shape. An umbel is formed by numerous pedicels (Latin: pediculus, “footstalk,” diminutive of pes, “foot”), that is, stalks, radiating out, like an umbrella’s ribs, in equal lengths from a central stem, which is termed a peduncle (Latin: pedunculus, “footstalk,” diminutive of pes, “foot”). Umbellate inflorescence is classed as racemose (Latin: racemus, “cluster, bunch,” akin to Greek ῥάξ, rhax, “grape”) because flowering occurs in clusters. Daucus is one of the largest genera (Latin: genus, “descent, family,” Greek cognate: γένος, genos, "race, stock, kin") in the family Apiaceae (Umbelliferae). Daucus comprises about twenty-five species. Of this genus, Daucus carota has widespread distribution throughout the world’s inhabited continents (excluding, of course, Antarctica) and is considered to be an undesirable weed, for example, in the United States and in Australia. Other Daucus species have narrower geographic distribution, mostly occurring in the Mediterranean. One of the most famous members of Daucus carota species is the domesticated carrot, the ubiquitous vegetable which was cultivated from a subspecies, Daucus carota subspecies sativus. There are two types of cultivated carrots, eastern/Asiatic and western, which differ in color. Roots of eastern carrots are yellow or, if containing the pigment anthocyanin (Greek: ἀνθός, anthos, “flower” + κυανός, kyanos, “blue”), red purple, and foliage is grey-green with bolt, i.e., flower prematurely. Western carrots have orange, red, yellow, or white roots with green foliage that only bolts in extended periods of low temperatures. The nativity of the two types of cultivated carrots is thought to differ. Eastern carrots are traced either specifically to the Hindu Kush region of Afghanistan or generally to the Inner Asiatic Center, which comprises Afghanistan, northern Pakistan, and Tajikistan, Uzbekistan, and western Tian Shan (Chinese: 天山, Tiān Shān, “celestial mountains”) in Central Asia. Western carrots are attributed to central Asia Minor (Greek: Μικρὰ Ἀσία, Mikrá Asía, "small Asia"), which denotes much of modern Turkey. Carrot and other vegetable seeds dating back to 2000 to 3000 B.C. have been found in Switzerland and southern Germany. Nevertheless, evidence of carrot cultivation before the tenth century is unclear because of historical confusion of terms for carrots and their similar relatives, parsnips (Pastinaca sativa), which have pale yellow to off-white roots. For this reason, references in classical Greek and Roman documents cannot be definitively determined. Genetically allowance is made for the early existence of wild carrots in the Mediterranean region west of Turkey. Purple, red, or yellow prevailed as carrot colors from the time of their appearance in the tenth century all the way up to the seventeenth century. Carrots were cultivated in Iran in the tenth century and have remained a vital ingredient in Persian cuisine. 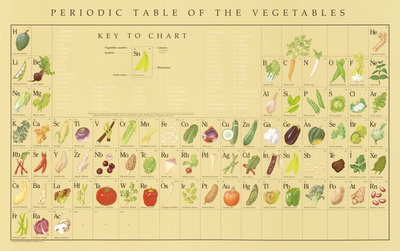 In fact, lingering proof of the versatile vegetable’s historical importance is evinced in the country’s geographic nomenclature. Plain of Carrots, Dashte Havij (Persian: dashte, “plain” + havij, “carrot”), is located in northern Iran near the village of Afjeh, which is 7874 feet (2400 meters) above sea level. Afjeh is located in Shemiran (Persian: cham, “cold” + ran, “slope”), the northernmost district of Iran’s capital city of Tehran (Persian: tah, “under” + ran, “town, place”), on the slopes of the Alborz Mountain Range. High peaks, such as Atash Kooh (Persian: atash, “fire” + kooh, “mountain”), with a height of 12,631 feet (3850 meters) and Mehr Chal at 12, 861 feet (3920 meters), that rim the plain provide a spectacular backdrop. Carrots historically were planted and grown on the plain. Nowadays other crops such as cherry orchards are cultivated there. Carrots appeared in Syria and North Africa in the eleventh century. European introduction most likely occurred in Spain by way of North Africa in the twelfth century. Italy in the west and China in the east welcomed carrots in the thirteenth century, followed by France, Germany, and The Netherlands in the fourteenth century. Carrots crossed the English Channel to England by the fifteenth century. Carrots accompanied English settlers to Jamestown, Virginia in the seventeenth century. Carrots presumably arrived in Japan in the seventeenth century but they were first reported there in the eighteenth century. Although Persian and Arabian cuisine favored purple carrots over yellow, which were considered of inferior quality, by the seventeenth century orange, white, and yellow carrots were standard in northern Europe. A concern over purple carrots was the unappetizing purple color that oozed throughout cookery featuring carrots. Note carrots in lower mid-foreground. The timeline for the development of the familiar orange rooted carrots is unclear. Correlating the dating of the selection for orange in carrots with the appearance in European oil paintings has been suggested. Generally, Dutch oil paintings began depicting orange carrots in the early seventeenth century. Nevertheless, a sixteenth century painting by Italian artist Vincenzo Campi appears to include orange carrots. Note carrots above Martha's left arm. The first written documentation of orange carrots in the Netherlands occurred in 1721 with descriptions of the ‘Long Orange’ and ‘Horn’ varieties. The Long Orange Dutch is the progenitor of the orange Horn carrot varieties (Early Scarlet Horn, Early Half Long, Late Half Long), from which all modern western carrots descend. The Horn carrot is named for the Dutch town of Hoorn, which is located in the province of North Holland (Dutch: Noord-Holland) in the northwestern Netherlands. About that time as well, white-rooted carrots were first mentioned in Holland. Orange carrots were first mentioned in Germany in 1740 with ‘Brunswick,’ possibly a ‘Long Orange’ cultivar, and in France in 1775. ‘Altringham,’ an English orange cultivar with an unknown origin, was first described in 1834. The burning question: Where did orange rooted carrots originate? The origin of orange rooted carrots remains imprecise and is undecided mainly between two geographical points. According to the artistic and written record referenced above, orange roots could have been selectively developed in the Netherlands. On the other hand, free hybridization between subspecies of wild carrots in the Mediterranean is considered as a possible progenitor (Latin: progenitor, “ancestor”). Specifically, the natural crossbreeding of Daucus carota subspecies carota from central Europe with Daucus carota subspecies maxima from the Mediterranean could have occurred through free hybridization because of geographic co-occurrence. Mediterranean Europe, Asia Minor, and Afghanistan are all possibilities for the geographic location of this free hybridization: in particular, Turkey’s vast Anatolian area (Greek: Ἀνατολή, Anatolē, "east, [sun]rise"), which was --- and still remains today --- one of the most important crossroads between Central Asia, the Mediterranean, and northern Europe. Moreover, great diversity in carrot cultivation has been recognized in Anatolia. However, no specific references to orange carrots have been made prior to their emergence in seventeenth century Holland. Thus, the origin of orange carrots remains an unanswered question, an unsolved mystery. Note carrots in lower left foreground. Interestingly, distribution of carotenoids is not uniform throughout the root. Rather, carotene concentration decreases downwards from the shoulder (upper portion) to the tip. In 1997 China edged past Europe as the world leader in commercial carrot production. The United Kingdom leads Europe in carrot production, followed by France, and the Netherlands. Other significant producers include Germany, Poland, Russia, and the United States. Significant South American producers include Argentina and Brazil. As a biennial (Latin: bi-, “two, twice, double” + annus, “year”), carrots complete their life cycle in two years. Their natural life cycle is observed in temperate climates, which is where they are largely grown. Subtropical regions raise carrots as annuals (Latin: annus, "year"), compressing their life cycle within one season or one year. Carrots are primarily grown as fresh produce, followed by canned and then frozen offerings. Favorable features for seed production sites include dry summer weather, adequate irrigation water, low incidence of wild carrots, and overwintering. In the United States the Pacific Northwest, encompassing eastern Oregon and Washington, southern Idaho, and northern California, provides ideal seed production sites. Chile serves as the primary South American seed producer. Other seed production sites include southern France, Israel, Italy, and Japan. While the root shape of carrots is essentially conical, the length may range from almost 2 to almost 20 inches (5 to over 50 centimeters). The desirable length averages between about four to almost ten inches (10 to 25 centimeters). Diameter ranges from under one-half inch to almost 4 inches (one to 10 centimeters). Temperature is one of the main factors that influences root length and shape. Warm day and cool night temperatures provide the perfect growing conditions for preferred lengths and shapes. The four major types of western cultivated carrots are grouped according to their length and shape. Chantenay carrots, which have a noticeable sweet taste, were created almost two centuries ago in 1837 in Châtenay-en-France in northeastern France. Chantenays are short to medium in length, at about 3 to 6 inches (about 7 to 15 centimeters), and stocky, with a diameter often bulging at 3 inches (8 centimeters), and tapering to a blunt tip. Their slender shoulders average around 1.5 inches (around 4 centimeters). Their short length makes them perfect for window box gardening. Red Core Chantenay is a popular variety. Their fastidious commercial cultivation, which nowadays is observed on organic farms within and beyond French borders, entails covering the crop with locally grown straw as a protection against frost and heat. After the harvest the straw is integrated into the soil as a soil conditioner. Danvers are medium long at 8 to 14 inches (about 20 to 36 centimeters). Danvers carrots have broad shoulders, often over 2 inches (5 centimeters). Danvers varieties taper to a pointed tip. Favorites are Scarlet Keeper, which is a popular juicing variety, and St. Valery. "Par une sélection persévérante, on est arrivé à la perfectionner et à en faire une belle carotte beaucoup plus colorée que précédemment." Imperator carrots predominate in Canada and the United States. They are often sold in cello packs in American supermarkets. They are medium long, around 8 to 14 inches (about 20 to 36 centimeters), tapering from slender shoulders, around 1.5 inches (around 4 centimeters), down to a slightly pointed tip. The flavor of Imperator carrots is less sweet than other types. Favorites are Japanese Imperial Long, which claims a maximum possible length of over 2 feet (around 61 centimeters), and Long Imperator. Nantes carrots are slender with a diameter a little over one inch (about 3 centimeters). Medium in length, they range from 5 to 8 inches (about 13 to 20 centimeters). Favorites are Scarlet Nantes, which may be bright red, and Nantes Coreless. Carrots may be grown indoors. Imperators are primarily consumed in the North American countries of Canada and the United States. The rest of the world favors Chantenay, Danvers, and Nantes varieties. Note carrots in low left foreground. Daucus carota has undergone amazing transformations in its journey from wild to cultivated life style. Western carrots are one of the most popular vegetables throughout the world. Who has not heard of carrots? Who does not recognize them? Who has not eaten them? Carrots do not suffer from the same disdain from children as peas. Is it their cheery orange color? Is it their crunchiness? Is it the combination of their healthy benefits with a refreshingly fresh taste? Is it because of their versatility that ranges from an easy snack as sticks or baby carrots to an important stew ingredient to steamed vegetable platters contrasting beautifully with white cauliflower and green broccoli to carrot muffins to the incomparable dessert as carrot cake? Is Bugs Bunny responsible for their forbearance, if not their enthusiastic acceptance? Whatever the reason, whatever the recipe, carrots have a worldwide following, especially in their orange garb. Would a carrot by any other color have achieved such prominence? Source: Otto Thome, Flora (1905), Vol III, Plate 457, opp. p. 367, Public Domain, via Biodiversity Her. Lib. “Barge Jahan and Afjeh villages in Lavasanat region, north of Tehran.” Programs. Iran English Radio IRIB World Service. Wednesday, December 29, 2010. Banga, Otto. "The Development of the original European carrot material." Euphytica, Vol. 6 (1957): 64-76. Banga, Otto. Main Types of the Western Carotene Carrot and their Origin. Zwolle, Netherlands: W.E.J. Tjeenk Willink, 1963. Banga, Otto. "Origin and distribution of the western cultivated carrot." Genetica Agraria, Volume XVII (1963): 357-370. Grieve, Maud. A Modern Herbal: The Medicinal, Culinary, Cosmetic and Economic Properties, Cultivation and Folk-Lore of Herbs, Grasses, Fungi, Shrubs & Trees with Their Modern Scientific Uses. Harcourt, Brace & Co., 1931. Heywood, Vernon H. “Relationship and evolution in the Daucus carota complex.” Israel Journal of Botany, Vol. 32: 51-65. Lindman, Carl Axel Magnus. Bilder ur Nordens Flora. 3rd ed. Stockholm: Wahlstrom & Widstrand, 1917-1926. Rubatzky, Vincent E., Carlos F. Quiros, and Philipp W. Simon. Carrots and Related Vegetable Umbelliferae. Crop Production Science in Horticulture Series: 10. Oxon and New York: CABI Publishing, 1999. Simon, Philipp W. “Carrot Facts.” Research > Vegetables Crops Research Unit. U.S.D.A. Agricultural Research Service. Last modified August 4, 2004. Thomé, Otto Wilhelm. Flora von Deutschland, Österreich und der Schweiz. Zweite, vermehrte und verbesserte Auflage. Band III. Mit 143 Tafeln in Farbendruck. Gera, Germany: Friederich von Zezschwitz, 1905. Vavilov, Nikolai Ivanovich. Origin and Geography of Cultivated Plants. Translated by Doris Löve. Cambridge: Cambridge University Press, 1992. Vilmorin-Andrieux et Cie. Les Plantes potagères: Description et Culture des Principaux Légumes des Climats Tempérés. Troisième éd. Paris: Chez Vilmorin-Andrieux & Cie, 1904. 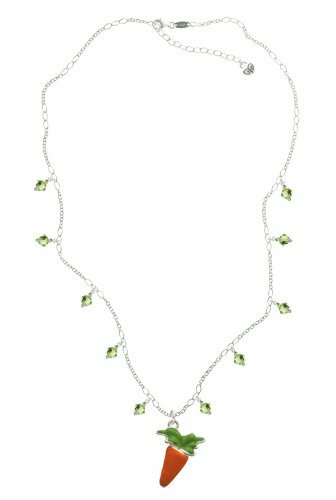 "A sea of Wild Carrot (Daucus carota)"
Silver Plated Enameled Carrot Italian Peridot Waterfall Crystal Dangle Necklace is 20 inches long and comes with a two inch extendor. 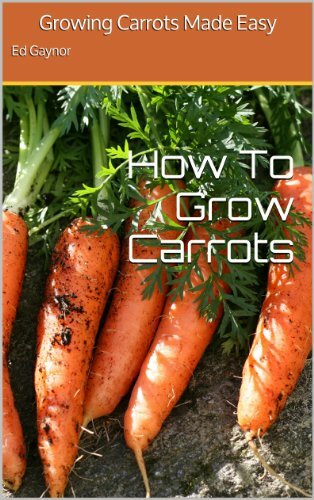 Complete guide to growing your very own tasty carrots: takes you through each step from preparing your soil the whole way to harvesting your own crop of carrots. frankbeswick, Yes, gardeners have many insights to share, and I'm happy that you now know about the excellent camaraderie of carrots and tomatoes! I am close to finishing a page on companion planting, which is such a win-win practice: winning for the paired plants, winning for gardeners! Thanks. Tomatoes and carrots in companion planting is new to me. This is important, while I have an RHS advanced certificate in Horticulture, I find that I have just scratched the surface and there is so much to learn from other gardeners. frankbeswick, Congratulations on your exuberantly growing carrots, and please accept my sympathies on your loss of the seedlings. Carrots can be temperamental sometimes. I always pair them with their pals, tomatoes, which guarantees bumper crops of both! For some strange reason no one on my allotment can grow carrots directly in the ground. We get little stunted ones. We have to used raised beds. In these raised beds the soil contains very much compost, and I like to mix some sand in it, as sand is good for carrots. I had great carrots in cut-down pieces of plastic drain pipe, some of which [carrots] were nearly eighteen inches long, but in bad weather the next year the rain washed the soil from the piples and destroyed the seedling carrots. cmoneyspinner, Me too I agree that a traditional cornucopia should include not only pomegranates but also a rainbow of carrots. The violet-tinted flowers of chives are a popular nectar plant for butterflies, especially spring azures, acmon blues, marine blues, creamy marblewings, and orange sulphurs.